Five for Friday: Historical Fiction, here we come! Perhaps, one of the best joys of Friday is being able to sit down at the computer for a minutes to blog about the week. It's really the little things in life that get me by! Plus, right now my student teacher is rocking it and teaching all day long... so I've got lots of time to think about new blog posts! Let's hope the creativity starts flowing! Until then... 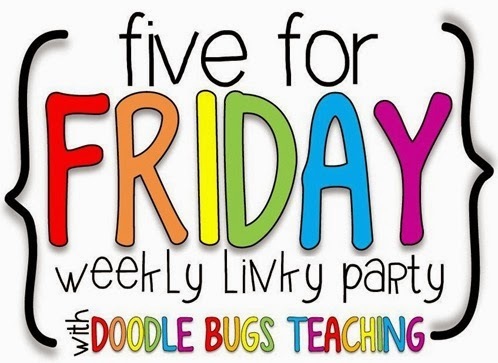 I thought I'd start simple by linking up with Doodle Bugs Teaching for the always inspiring Five for Friday! Sent my student teacher home with one of my favorite "teacher" resources for our Civil Rights unit! If you have to teach the Civil Rights or just want to brush up on your own knowledge then you definitely need to check out Belinda Rochelle's Witness to Freedom -- this book is such a great read! I actually copied a few articles out of the book last year for my students as well. Plus, all the stories and biographies focus on how kids were able to participate in the movement. It's an easy read with lots of great information and background. New book club books were passed out this week! We're starting our historical fiction reading unit next week. Students had an opportunity to pick their three favorites before I created groups. We offered 11 different choices at a variety of levels. Some students already started to dig into their books today. Love watching them devour books! Here's a few of my piles (minus an additional crate)... I think I'll have enough copies this year! Speaking of Civil Rights... we're getting into the history of the Civil Rights movement this week! Front load, front load, front load. We've been reading nonfiction and watching videos so we're ready to read our historical fiction novel! We've done quite a bit of vocabulary work as well. On Monday, we're taking all of our new vocabulary and posting it to our classroom word wall! I have the headers and blank paper ready to go. Definitely worth the time to display throughout our unit. Want a copy of the words? Grab a copy of our Civil Rights word wall handout from my Drop Box. I might have a bag problem... I love my Scout teaching bag! 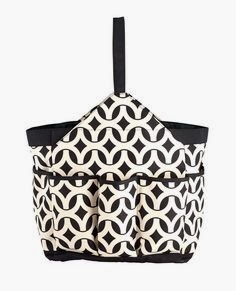 It's fantastic but I was looking for something a little wider to hold a few more items or maybe to use as a pool bag. I'm not really sure - you don't need a use to buy everything, right? Since my teaching partner has started selling Initials, Inc. I ordered the Big Grip tote. Let's hope it's super cute with my free personalization! Favorite moment of the week: Two of my girls sitting side by side in the computer lab during our essay publishing session. One student finished early so she was helping "edit" and look over her friend's final copy! Love building a community of writers. It's been too long blogging world! This is what happens when you miss over a week of school with snow days and then have holidays... I think we've went one full week the past two months! So, I'm finally getting my blog back on track and organizing my thoughts! 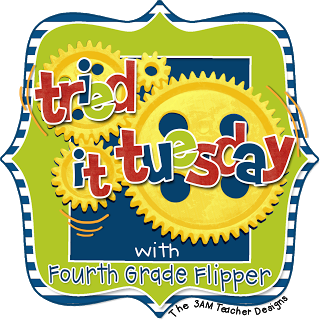 Today, I decided to come back and link up with Holly at Fourth Grade Flipper for Tried it Tuesday! I know, I've mentioned Close Reading before but I'm really starting to fall in love with the concept of a close read! My students are doing such a great job at looking for textual evidence and really thinking about their reading this year. I'm one proud teacher! Since, I loved Ashleigh's (from Ashleigh's Educational Journey) Holidays Around the World Close Reading bundle, I thought I'd check out some of her other products. Her Winter Olympics Close Readings do no disappoint. 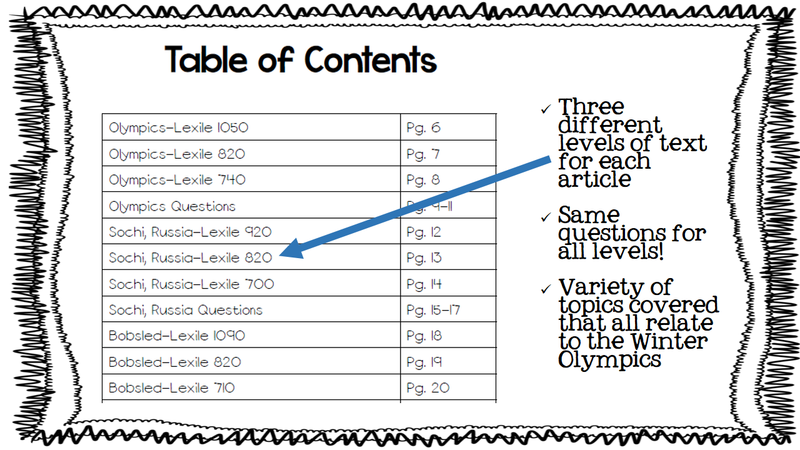 There are three levels of each passage that rank from about Q/R to W for guided reading levels. The topics range from general Olympics history, to Sochi Russia, to many sporting events at the Olympic Games. Although some of my fifth graders are reading at a high level than W, these passages are still wonderful for practicing different close reading skills. Plus, the content is "not too boring" according to the fifth grader consensus. We've already read about the four different types of Skiing last and we will continue on with Bobsledding this week. Even if it's not a winter Olympic year, these passages do a great job getting students to thoughtful go back and reread. These lessons are great preparation for another close reading my class will do for a Social Studies text about the civil rights movement this Friday! Click the handout for a close reading excerpt & questions . What new reading strategies have you tried with your students? Do you use close reading in your classroom? Spark Student Motivation: Double Stuff Your Paragraphs! Today I'm linking up once again with Joanne at Head Over Heels for Teaching for her Spark Student Motivation Saturdays. Want your reluctant writers to give you a well written paragraph? Offer them a sweet treat for "double stuffing" their paragraphs! Currently, we're getting ready to start drafting our research based argumentative essays. These are a persuasive essay but students must also collect research which helps with their claim and any counterclaims. I've found that fifth graders love to argue but not all of them love writing! First I spark their motivation with the topics! I absolutely love giving my kids choice... however, since every student needs to read about both the claim and counterclaim - they really need a good text set to rely on. So, for this piece, my teaching partner and I gathered all the research. But we tried to choose topics our students care about! Should junk food and soda be sold in schools? Students spent time reading their text sets and researching their topics. Last week, we ended by writing our claims and making a chart of both sides of our arguments. The students did a great job with this activity and really wrote some strong thesis statements. So this week... we get to start double stuffing our paragraphs! Last year, I found some great resources online for using the OREO model for writing persuasive pieces. OREO stands for Opinion, Reasons, Examples/Explain, and Opinion restarted. We're changed ours to Opinion, Research, Examples, and Opinion restarted. This gets the students to write really hearty paragraphs full of research and examples to help support their claim or argue against the counter claims. Once students use some of the persuasive words and are able to provide a DOUBLE STUFFED paragraph filled with research and examples... then they can have an actual Double Stuffed Oreo! Yum! Last year, even my reluctant writers wrote well researched paragraphs all for three Oreo cookies! Oh, the power of a cookie! How do you motivate your reluctant writers? The Polar Vortex seemed to take eliminate a lot of my lesson plans and teaching in January. Let's hope February brings some normalcy and classroom love back to Ohio. February brings lots of great things my way... our Civil Rights unit, my new student teacher taking over the classroom, and an excuse to shop on Etsy for cute Valentine treats! 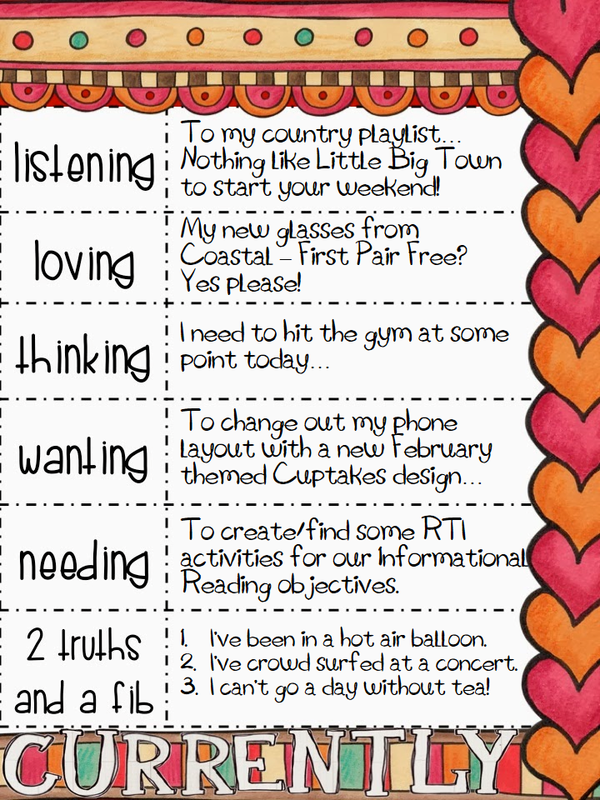 But, since some of those things are a few days or weeks away... Might as well link up with Farley from Oh' Boy Fourth Grade for her February Currently! Seems like the right thing to do at the top of the month! Listening - I've been really listening to country music a lot lately. I'm trying to get ready for the Buckle Up Festival that's coming this summer. I'm so excited for a multi-day country fest coming to Ohio! Since we're having a really short summer this year - this may be part of my vacation! Loving - I have wonderful glasses. I wear them everyday and I'm not so much a contact person. But I really wanted a back up pair of glasses since I do wear them everyday including laying in bed watching TV (shhh!). So, I had tried Zenni before and wasn't too impressed with the quality but they were MEGA cheap! With my new prescription I need some seriously thin lenses so I decided to try out Coastal's First Pair Free deal! I'm super impressed. I got an entire pair of glasses with thin lenses, anti-glare, anti-scratch for only $58 out the door! Wayyyyy less than going to store. And unlike my Zenni pair these feel like store bought glasses - not cheap plastic frames! Win-Win-Win! I went with some with a retro flair....so cute! Right? 1. I have been in a hot air balloon. TRUTH. My old college (Go Saints!) held a big cookout a few years back to welcome the new students and celebrate with all the alums. I went back and they had free hot air balloon rides! It was super scary being up so high and getting into the basket was an accomplish in and of itself since I'm only 5'1. But it was so much fun! 2. I have never crowd surfed. FIB. I have too many control issues to let other people hold me up. I did stand front row of an Offspring concert back in college. That was as adventurous as I tend to get. 3. I can't go a day without tea. TRUTH. I've been actively trying to cut out soda from my diet. But I still crave the caffeine. My favorite coffees from Starbucks are loaded with calories and sugar... so I've been really trying to drink just tea or water. So far so good. I stop at McDonald's or Chick-fil-a nearly every morning to pick up a big unsweet tea. So far so good on kickin' soda to the curb! Don't forget to stop by Farley's Currently and leave some others some love!